For shopping fun, head to Paulista Avenue or Mercadao - Sao Paulo Municipal Market. 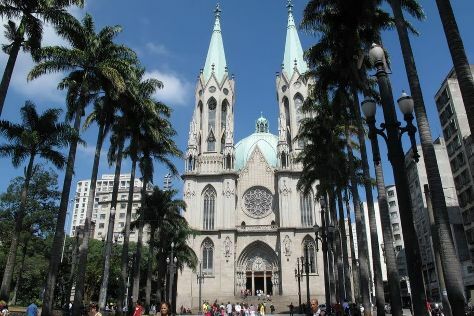 Popular historic sites such as Catedral da Se de Sao Paulo and Mosteiro De Sao Bento are in your itinerary. There's much more to do: admire the masterpieces at Pinacoteca do Estado de Sao Paulo, wander the streets of Liberdade, tour the pleasant surroundings at Ibirapuera Park, and take in the exciting artwork at Centro Cultural Banco do Brasil. Plan my Sao Paulo trip by asking Inpirock to come up with tips and suggestions. If you are flying in from Pakistan, the closest major airports are Congonhas Airport, Guarulhos - Governador André Franco Montoro International Airport and Viracopos International Airport. In March, daytime highs in Sao Paulo are 32°C, while nighttime lows are 22°C. Wrap up your sightseeing on the 28th (Thu) early enough to travel back home.